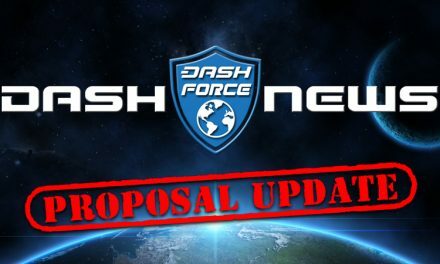 Continuing with my goal of reviewing all Dash Treasury proposals in the past year we will now look at proposals that were funded on November 4th of 2016. Looking at this months list of proposals there are many that rolled over from my review of October 2016 done last week. Development projects received 2/3 of the funding with marketing getting the rest. The first observation comparing Nov to Oct 2016 is that the price of Dash went down from $11.97 on Oct 5th to $9.12 on Nov 4th. That is a drop of almost 24% – ouch! It is not surprising that the total budget was down 30% from the previous month. 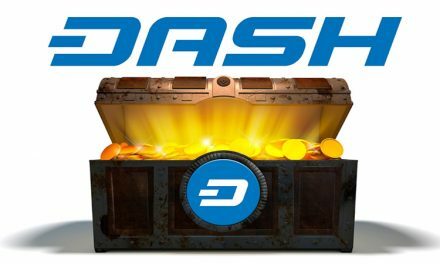 The good news is that as I write this the price of Dash is $285.54 – 31 times higher in one year with the Dash treasury budget gone up by the same factor. Eight of the projects funded in Nov 2016 got less than the amount it would take to submit a proposal today. 81% of the funding allocated went to projects submitted by the Dash core team and more than 50% of that funding went to business development projects. 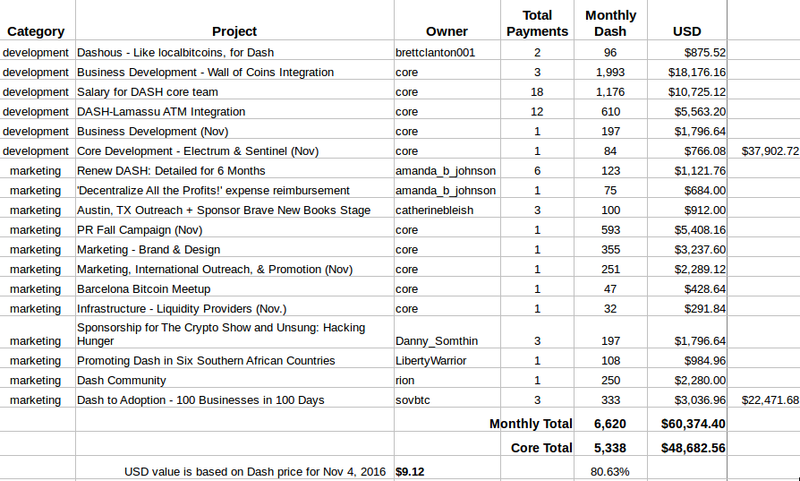 The majority of the development projects funded in November 2016 were for work to expand the Dash ecosystem not to support the core software. Almost a third of the total budget went to fund Wall of Coins integration. 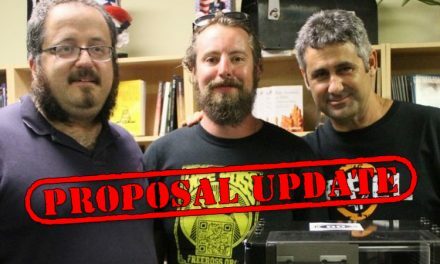 This proposal had been previously submitted by Wall of Coins and did not get masternode support. They worked with the core team to lower the total cost and agreed to payments based on performance. Based on the voting these changes were enough to make it pass with an overwhelming majority. Wall of Coins integration provided a sorely needed US based fiat gateway and was successfully implemented. I have never seen any reporting to show the volumes of Dash that have been bought / sold in their system so can’t judge if it was a long term success. It is interesting that in the same month Dashous was funded which is an “in person” fiat gateway for Dash. 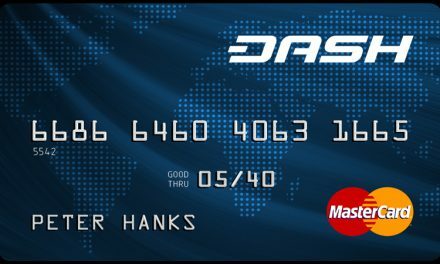 Dashous bills itself as the “localbitcoins” for Dash. It is still in operation with a number of active listings. It was previously covered in depth here. Other development projects include Dash core salaries of $10.7K, business development of $1.8K. Also included was continued support for Lamassu ATM integration a project which was never completed. The 12 marketing related proposal for November 2016 were allocated $22,472 for an average of $1,873. Just over half of the funding went to core sponsored proposals. This proposal seeks funding for professional graphics design services for our logo, background graphics, print media, document templates, upcoming website design work, and other deliverables. This was funding for a contract with EtherDesign for various services. I don’t know if the current Dash logo was done by them or not as I can find no updates on work completed. Looking at their website they have a lot of crypto clients listed but I did not find Dash. This was a continued proposal used to fund translation services for Dash content. A very unusual fact is that this proposal was passed with no comments entered. Proposal to get 100 businesses to adopt Dash. Very few were actually recruited. … it is a github organization separate from, and complementary to, the main dashpay organization. The dashcommunity organization hosts repositories for various purposes – something for everyone. I’m proposing it in order to increase community contribution and continue the general decentralization of Dash. 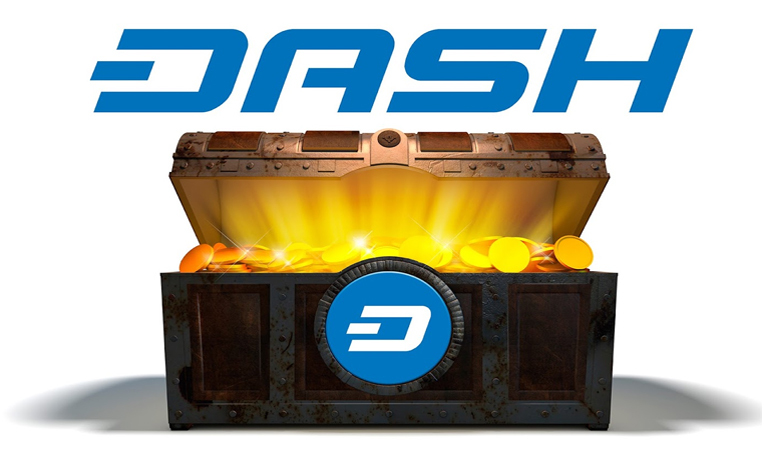 It will achieve this by lowering the barrier to entry and raising the financial incentive for software developers, writers, marketers, and anyone else to use and contribute to Dash. This project funded development work by rion. He seems to have put a lot of thought and work into the project but there is little evidence that anyone else participated in the community. There were many comments to the proposal about what a good idea it was but I guess almost no one followed through. This is the first month of Dash’s ongoing sponsorship of the Crypto Show. Continued funding for Dash Detailed covered here. From the 1st week of November, 2016 to February, 2017, I will be traveling through six Southern African countries to interact with the Blockhain/Bitcoin Communities, promote and write about Bitcoin programs and projects for the Coin Telegraph. These are the countries I will be visiting: Angola, Botswana, Namibia, Zambia, Zimbabwe &amp; South Africa. I will hold meet-ups, interact & interview industry players, activists and ordinary people on the streets. Also, I will do podcasts for the Coin Telegraph and other news outlets. Botswana will be my base as I travel to all the other countries overland. In each country I will spend at most two weeks. I can “assume” that this was completed but find no updates. The latest is this from December 27th asking for an update. This is the 2nd payment for this proposal which funded a banner and some meetups. Looking back it seems that having the funding to not only pay for the core code base development but to also fund projects to grow the ecosystem must have helped to increase the overall value of Dash.